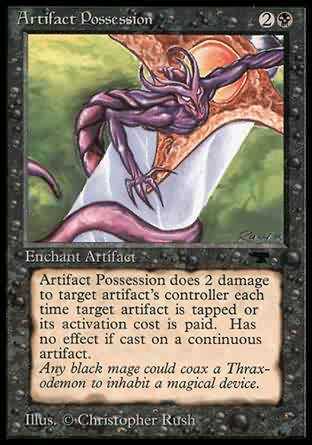 Artifact Possession does 2 damage to target artifact's controller each time target artifact is tapped or its activation cost is paid. Has no effect if cast on a continuous artifact. Whenever enchanted artifact becomes tapped or a player plays an activated ability of enchanted artifact without T in its activation cost, Artifact Possession deals 2 damage to that artifact's controller.